Thomas Edison invented the phonograph in 1877. No one knows for sure who the very first recording artist was. Here is a look at an early recording artist I have in my collection. American Symphony Orchestra. 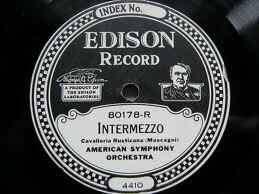 Edison's National Phonograph Company "symphony" recordings began in 1898 under the Edison Symphony Orchestra. In October 1908, Edison renamed the orchestra the American Symphony Orchestra (the same month the Edison Military Band was renamed the New York Military Band). Listen to recordings by American Symphony Orchestra or Edison Symphony Orchestra, or other early recording artists, by visiting the Cylinder Preservation and Digitization Project at the University of California at Santa Barbara. Labels: American Symphony Orchestra, Edison Records, Edison Symphony Orchestra, Phonograph.